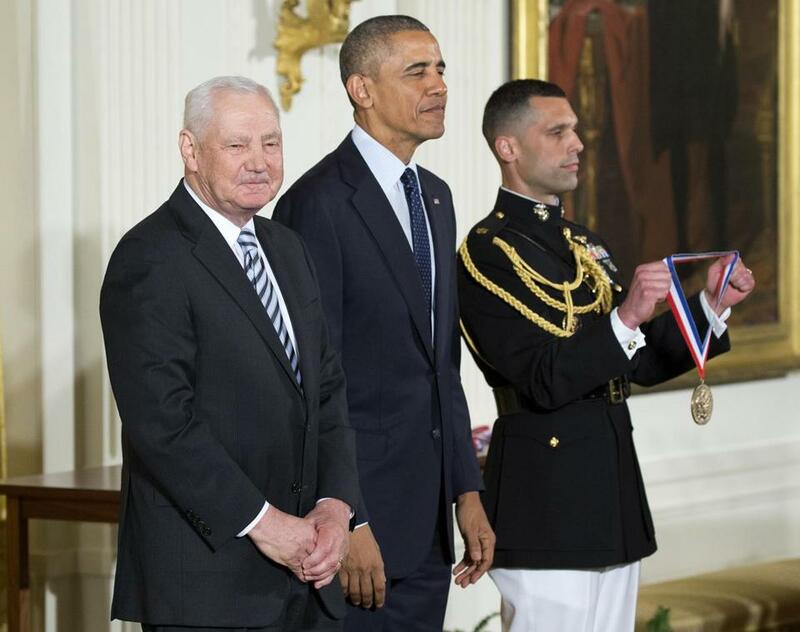 Dr. Falkow shared a White House stage with President Obama when he received the National Medal of Science. NEW YORK — Stanley Falkow, a much-honored Stanford professor who discovered how antibiotic resistance spreads among bacteria and how bacteria cause disease, died on May 5 at his home in Portola Valley, Calif. He was 84. His wife, Lucy Tompkins, who is also a professor at Stanford, said the cause was complications of myelodysplastic syndrome, a rare disorder in which the bone marrow fails to generate blood cells properly. Over his long career Dr. Falkow won just about every major award in science, including the National Medal of Science. In 2007, he received the honor he coveted most when he was elected a foreign member of the Royal Society in Britain. Founded in 1660, the society has had fellows including Newton, Darwin, and Einstein. Dr. Falkow’s discovery of one of the most important ways that bacteria can become resistant to antibiotics began with his observation that resistance can be transmitted from one bacterium to another. Then, in the 1970s, he figured out how this happened. Tiny rings of DNA known as plasmids can contain genes that make bacteria impervious to antibiotics, and these plasmids can move from bacterium to bacterium. Dr. Falkow realized the implications of this finding: that resistant bacteria thrive in the presence of antibiotics and then spread their resistance to other bacteria. In the late 1970s he urged the Food and Drug Administration to ban antibiotics from animal feed to reduce the creation of antibiotic-resistant bacteria on farms. The administration’s commissioner at the time, Donald Kennedy, was persuaded, but the effort ultimately failed. Dr. Falkow subsequently discovered that plasmids can also contain disease-causing genes and transmit them to bacteria. That led him to study disease causation — asking, for example, how those transmitted genes turn a harmless microbe into one that gives people diarrhea. Sometimes, he learned, the added genes let bacteria produce toxins. Other times, he discovered to his surprise, the genes allow bacteria to produce proteins that in turn allow microbes to attach themselves to host cells, even burrowing inside the host cells and living there. Not just a lone researcher, Dr. Falkow trained a generation of scientists — more than 100 doctoral students and postdoctoral fellows — and was remembered for his generosity. When students first came to his lab, he would often suggest they pursue projects he might have developed himself. “That was reflective of his creative mind and his confidence that he could always find interesting questions to study,” St. Geme said. Stanley Falkow was born in Albany, N.Y. His family later moved to Newport, R.I., where he grew up. His father, Jacob Falkow, was a shoe salesman and his mother, Mollie Gingold Falkow, ran a corset shop. Although Dr. Falkow’s parents worked six days a week, money was tight — the family lived in walk-up apartments, and for years Dr. Falkow slept on a sofa, Tompkins said. There were no books in his house, but when young Stanley was 11 he read a library book — “Microbe Hunters,” a 1926 classic in the field by Paul de Kruif — that fired his ambition to become a microbiologist. After graduating, he applied to the University of Maine because it had a bacteriology department. He received an acceptance letter within a week, though for years he could not understand why the school had accepted him, and so quickly. Dr. Falkow earned a doctorate from Brown University and, after holding positions at other universities and at the Walter Reed Army Institute of Research in Maryland, landed at Stanford in 1981. He remained there the rest of his career. Besides his wife, Dr. Falkow leaves two daughters, a sister, a stepson, two granddaughters, and two stepgrandchildren.